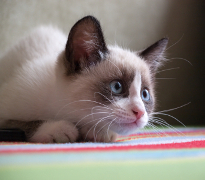 So-called because of their trade-mark white feet, or ‘socks’, the Snowshoe is a Siamese cross originally bred in the U.S. in the 1960s. As rare as its catty cousin the snow leopard, Snowshoes are very hard to find because of the exact breeding requirements needed to create those beautiful markings. Prospective owners will be glad to know that the voice of the snowshoe is not as loud as their Siamese ancestor and that, being very locally minded, they are unlikely to run away. Talking of minds, the snowshoe’s is first class, with a high intelligence and aptitude for learning tricks and opening doors. Snowshoes are affectionate, sweet-tempered and mellow, enjoying the company of humans and being petted. Great with kids and other pets, they are social and docile, showing great devotion and love towards their owners. They hate being left alone for long periods of time though, so if you’re out working all day, get two. By joining this group you use the buying power you share with other Snowshoe owners to get a better deal on insurance. Currently, there is an offer available with MORE TH>N, so please join the group to find out more. Great news: 32.5% discount with our combined Bought By Many member and online discount on MORE TH>N’s Basic, Classic, and Premier Pet Insurance. It’s an exclusive offer that you won’t find anywhere else. This discount goes up to 39.25% if you insure more than one pet. "The cover was exactly what I needed for my dog at a price I can afford, less than a third of the cost of previous quotes"